GUELPH, Ont. 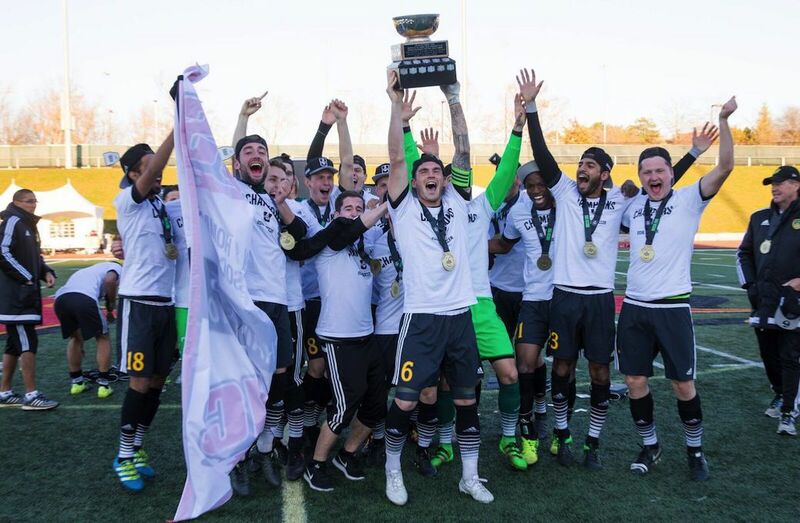 (U Sports) – The University Alberta Golden Bears men's soccer team are champions for a fifth time in school history. The Golden Bears, seeded third at the CIS championship, defeated the UQAM Citadins 1-0 to earn the Sam Davidson Memorial Trophy at Alumni Stadium Sunday afternoon. Fourth-year midfielder and Edmonton, Alta., native Ajay Khabra had the match-winner, a header in the 58th minute, which gave the Canada West champs their first title since 2006. "This is an unbelievable group of players," said Canada West coach of the year Len Vickery. "Right from the get go, they found ways to win. They surprised us right out of the gate, they kept on winning. Even in the toughest of tough games, they would always sneak a goal or if we were down one, they would score two. "I don't know how they do it, but we would like it to keep going forever and ever." Alberta captain Tim Hickson, a fourth-year midfielder from Edmonton, thought his side's hunger and ability to disregard past accomplishments helped get them over the finish line. "It's absolutely phenomenal," said Hickson, his arms wrapped tightly around the trophy. "I'm not going to let this go tonight. This team that we have is by far the best team I've played on and I'm so happy to be a part of it. "Our coaches told us that we were a record-setting team. We'd only lost one game but it didn't affect us. The whole way through, it was 'We haven't won anything yet.' Our record didn't matter, winning Canada West didn't matter. We hadn't won anything until we could lift this trophy." UQAM was making its fourth ever CIS tournament appearance (third straight), but the undefeated RSEQ champions (6-0-6 entering the week) suffered its first defeat of the season at the most inopportune time. The creative Citadins, who showed offensive firepower throughout the week, were unable to test Alberta goalkeeper Connor James often in the final match, hitting the target just three times all day. At the final whistle, the drained UQAM players collapsed on the pitch, the sadness on their faces evident. Lamouile pulled his shirt over his head while lying flat on the turf. Alberta seemed in a prime position to get the match's first goal when they manufactured a rare two-on-one counter in the 53rd minute, but Tolu Esan's cross to a wide open Ajeej Sarkaria was scooped up by Lamouile. In the Golden Bears' next venture down the pitch, Esan was tackled in the area, prompting screams for a penalty but the referee saw no foul. Esan began to take the game over and in the 58th minute, Alberta got the goal they were looking for. 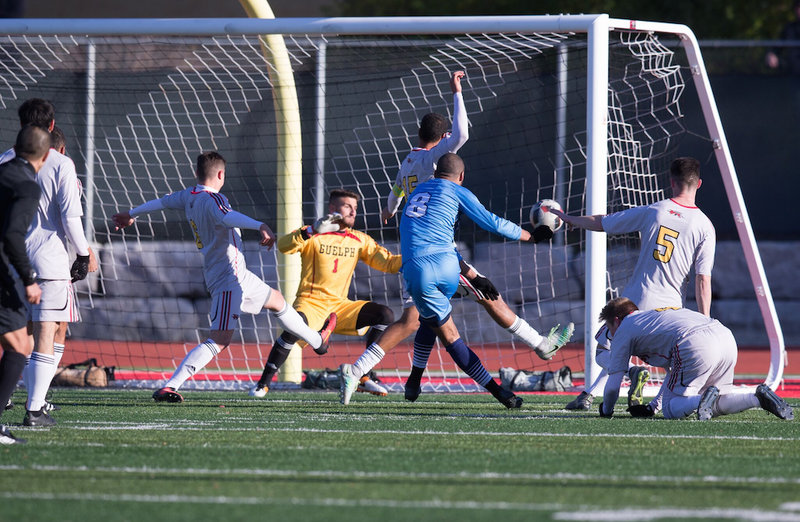 Niko Saler's corner glanced off of a head and found Khabra, who generated his own powerful header that snuck in underneath the crossbar and past the leaping Lamouile. "Niko put the corner in like usual, it got deflected and I was lucky enough to be right there and get my head on it," said Khabra. "Hands down the biggest goal of my life." "We worked so hard and it paid off. It's awesome that we got to do it together. We work for each other - that's the number one characteristic of a winning team. No matter what came at us, we worked through it. It's a resilient bunch of guys." "It was going to take something a little bit extra -people like Tolu and Ajeej (the Canada West Player of the Year) and Bruno (Zebie) coming from the midfield, they weren't going to be denied," added Vickery. "And we had our secret weapon, Ajay Khabra on the header. We've seen it a couple times this year and each season. They key in on the big guys, the guys who are an aerial threat and Ajay pops up with a little magic of his own." The two finalists understandably got off to a cautious start with little time and space to be had on the narrow Alumni Stadium pitch. But the tempo increased and Alberta had a decent chance in the 14th minute when Zebie stung a shot just over Lamoulie's net. UQAM responded in attack and almost went ahead about four minutes later, though Joderic Sedjro's chance near the left post was denied by an alert James. The desire not to concede was evident in a disjointed first half, with each team managing just two shots on target. "When it comes to championship games, the first bit is always tense," said Hickson. "You don't want to be caught off guard or caught on the counter. "I think the youth in our lineup and the fitness we have, we started taking it to them. Two thirds of the way into the game, we just found our pace and the gaps and utilized it."